Highland Council has deferred making decisions on further fare increases on its Corran Ferry until later this year. Councillors agreed to the move to allow members of the council and communities to see a study into the effect of previous cost rises. Annual inflationary increases of 4% were applied on 1 April 2013 and again last month. A 30p increase was also added to the cost of trips last winter. Councillors will next discuss prices at a meeting on 6 November. Highland Council said the previous increases were needed to cover losses of more than £170,000 on the route. Two vessels are available to the service, the MV Corran and a reserve ferry, MV Maid of Glencoul. The Corran Ferry allows access to and from the communities of Ardgour, Morvern and Ardnamurchan via a narrow stretch of Loch Linnhe in Lochaber. 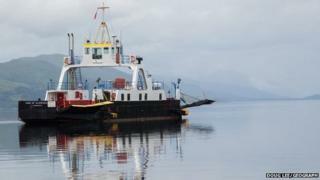 It is also used by people and businesses on Mull, who first travel to the mainland on the Fishnish-Lochaline ferry. The Corran Ferry and Fishnish-Lochaline services also offer tourists an alternative to the Oban to Mull ferry. He said: "We are aware that the full impact of annual inflationary increases and the 30p increase on fares per trip applied last November are still to be realised. "These impacts along with the results of the consultant's report and feedback from community councils and the area committee will be given full consideration on 6 November at the community services committee. "It is vital that we ensure that we have fully consulted with the community and Argyll and Bute Council before we consider the report to committee in November." He added; "While we recognise that the Corran Ferry service is of key importance to locals and visitors, the council has to reduce the gap between rising operating costs and the income generated from fares."